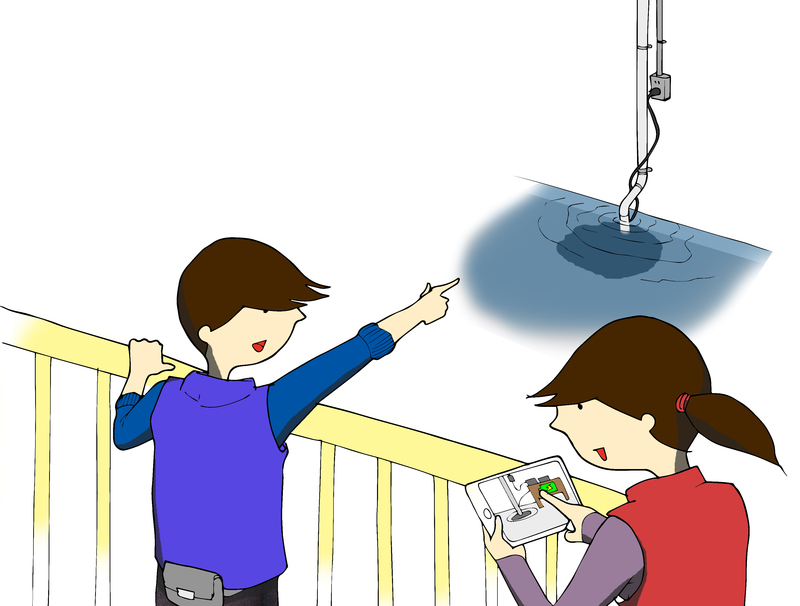 This image may not make as much impact as it should, but it is meant to be a smaller image in one widespread page depicting the process how the kids were putting together the clues to solve the problem of their neighbor Gerry. They were looking at the flooded basement in the last image, and after spending time observing the scene they realized similarities with their own basement (which makes sense when you have homes that are right across the street from one another). They notice a very similar pipe and cover on the floor, same as what their dad had explained to them here… This was an important clue because it serves as an anchor for the kids who have just started to understand how these sump pump systems take out water from the basement. Obviously the kids do not have any plumbing experience, (and this is a children’s book so they just might have that knowledge), but if something is explained as a story and on a high level (no technicalities or confusing details) kids can often get a useful understanding of the concepts how things work. Sarah is shown comparing photos she took of their dad’s sump pump pipe. It is all very graphic and easy to relay to the child reading the story. The point is to show how to realize common elements as part of forming an understanding of a subject.